Probably made at Winchester, although it is not certain by or for which religious house there, the Arundel Psalter seems to have been a personal prayerbook. Throughout the middle ages, the psalter served as a book for services and as a personal devotional book. Individualistic choice of saints for its calendar and litany as well as Old English glosses on the Latin text suggest this one was used for private prayer. The calendar would have helped its owner coordinate prayers with feast days and the litany would have been a special personal petition to revered or beloved saints. Calculation of moveable feasts, or feasts determined by positions of the sun and moon (such as Easter), was always problematic because the formulae used and the calculations had to be correct, or else a church might end up celebrating a major feast on the wrong day. 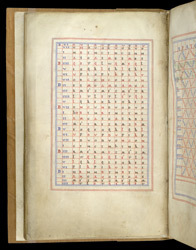 Tables such as this one helped those skilled in their use to determine the correct day. The person(s) for whom this psalter was made must have possessed a high level of literacy as well as position in their ecclesiastic community.